Experience in other jurisdictions has clearly demonstrated that increasing access to rural investment capital is absolutely critical to rural economic revitalization. Access to investment capital is crucial to business and economic development anywhere – but is especially important in rural areas. 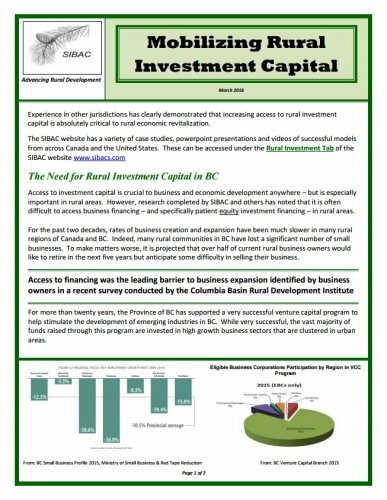 However, research completed by SIBAC and others has noted that it is often difficult to access business financing – and specifically patient equity investment financing – in rural areas. For the past two decades, rates of business creation and expansion have been much slower in many rural regions of Canada and BC. Indeed, many rural communities in BC have lost a significant number of small businesses. To make matters worse, it is projected that over half of current rural business owners would like to retire in the next five years but anticipate some difficulty in selling their business.